Recently I have been listening to a friend whose family is engaged in arranging end of life care for their parents. It has been hard on them all, and I have empathized with the problems they face. It is then not difficult to see why last week I would dream about my in-laws' end of life (which for them came in their 90s). The events in the dream had no reality from their actual last years. I think the dream was intended to focus me on the subject. On a practical level, concerns about how to help parents at the end of their lives are in my past as all my older ones have passed on. What I am left to think about is what I want for myself when and if that time comes. What I am going to write about is not just old. I am old. It's the really old. Maybe the word elderly would suit best. They are the ones no longer able to get around as they once did. Inside that woman over there, the one hunched over with osteoporosis and arthritis, is still the girl she once was-- bet she was a beauty. That proud old man, walking slowly with the lean body, he knew days where he was as strong as any man, and he still has a tough look in his eyes. And where they are today, soon enough I will be. I have read that some elderly feel they are ignored when they are out, that people don't see them anymore, that they are as though invisible. I wonder if it happens because people don't want to think they are heading down the same path. There has been a lot of emphasis in this country on face lifts and hair dye to hide aging signs. Is that being done to make younger people more comfortable with the fact we all get old? 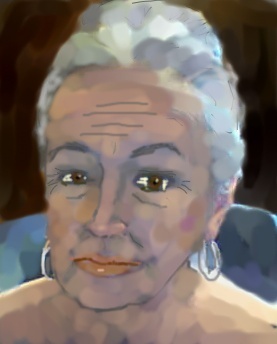 For the fun of it, and to illustrate this blog, I aged myself to see what I might look like as an elderly woman. I pulled down jowls-- yes, I know, not all old women have them, but I wanted to age my existing face as I think it might actually do. So I drooped the skin around my eyes, whitened my hair and when I was finished, thought-- oh my. Harder yet was when I showed it to a friend and said, I think it's how I'll look somewhere in my 80s-- late 80s preferrably. He looked at it critically and said more like 70... Whoa! So soon, am I ready for that??? That's not that far away! However, what we look like in the mirror is not the problem of aging. The real concerns are loss of strength and mental accuity. If we are lucky, we will live, love hard, and the end for us will come quickly after many good years. It isn't always that way. What does our country do as more and more of us are old and need help? Pension plans have mostly folded, except for those in government. Many people stay in debt their whole lives. Some younger people begrudge even the small amount Social Security provides. Certain nations have thought they'd solve the problem of elder care by encouraging immigration of younger people; but from what I can tell, that only delays the problem. There will come a reckoning-- too many old and not enough working young. In my opinion, euthanasia is not a moral option unless it is one made by an individual for themselves when facing diagnosed terminal illness. Old age fraility isn't like that. If you get to that age where you cannot remember to take your pills, where cooking a dinner might lead to burning down the house, where you may need to be reminded to take a shower, you could still have years ahead. Assisted living apartments solve the problem for some and for others they move in with family. Not everyone has family who can do that. Some hope against hope government will provide a panacea. In older, more primitive cultures, where survival of the whole tribe was not a given, the people sometimes were forced to leave the elderly to die along the trail. I used to think that was what I would do. When I got really old, and saw my strength waning, I'd go for a walk in the woods and just keep walking until I couldn't go any farther, sit by a tree, and wait. I thought that right up until I saw vultures and crows pecking at a sheep of ours that had gotten down and we hadn't seen until the carrion eaters had. The sheep was still alive. We could put it out of its misery; but if I was out in the woods like I had imagined, who would put me out of mine? I scratched that idea and am now aiming to be chopping wood or pulling blackberries until I fall over one day. But you know the best laid plans and all that. It's hard for any of us to know how it'll be, what we will feel, if we are among those who reach the age where independence is a problem. It isn't fun to think about, but I think it's an important part of life to plan for the end-- not dwell on it but just know what we want and make sure others know also; so we don't leave the problem for family to work out. I'll try a second time & hope Blogger will work this time. This is an important subject that most of us will have to face eventually, unless we die sooner than expected. We all should leave instructions for our children & executors as to our wishes. It isn't fair to force them to make all those decisions. I tried to get my Mother to sort through her 60 year accumulation of things in her house while still alive. She didn't, so I had to do that & I lived 300 miles away. A lot of things were thrown away that should not have been, had she sorted the important from the un-important. I am in the process of de-cluttering my life, so there will not be that much to sort through, ANd I am making journal/Scrapbooks for both children so They wont have to guess who was who. As far as elder-care, I am hoping that I will still have good mental acuity into my last years. I may have to go into assisted living, but if I ever get to the point that I am lying in a bed all day, not knowing what is going on around me, not recognizing who comes in, not able to talk or think, then I want someone to send me on my way...We are much kinder to our pets than we are to our parents. As for your picture, I looked at it and thought what a beautiful woman Rain's Grandmother was. If you should look like that, be very very thankful!! You would be Beautiful! Now why doesnt it remember who I am? arrrgghhh it's happeneing, I cant remember my blogger passwrod!! The exercise of making a painting of what we will look like 20 years from now is fascinating. I'll give it a whirl. I have always thought that you are very fotunate to have high cheek bones so the sagging will not be so much of a problem. More important is the attitude. The twinkle in the eyes, careful selection of lip stick, and the signature ear rings symbolizes vitality living on and on. My best women friends and I talk about this - we have plans to live in a house/place that includes space for care givers and help that can change over time as we age - we can support one another in community and still have the care we need. This is beautiful, Rain. I love the thinking in it, and the heart. I think about this often-- both for my mother who is going to be 81 next month, and myself. I once thought I'd like to live in a house full of other older women, as Suzann mentions. I still think that is a possibility, about 20 or 30 years from now, if I live that long. Our country does not provide an intact community, and so we must create our own communities, and solve these problems ourselves. I think our generation has always had the vision to do so. We're growing old together, and we're going to make it work! Loved this post intensely. I lurk here often but this particular combination of words prompted me to show myself.